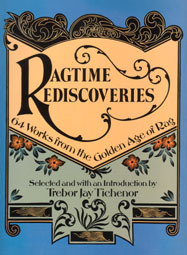 64 Works from the Golden Age of Ragtime. . .These 64 pieces are all piano rags, so there are no lyrics. The back cover describes these Ragtime Rediscoveries as "forgotten rags composed by little-known pianists and arrangers (including many women) and printed by small specialized local music publishers."